2T - $26.99 Only 1 left! Sometimes having a kid is hard. Heck, who are we kidding, it’s always hard. Even when it’s fun. But that is the price we pay for our little “bundles of joy”. (More like “bundles of endless energy” right?). Their crying should have to be listed as a deadly weapon. We know they don’t do it on purpose, but at the same time, we die a little every time we can’t get them to go to sleep. Then they grow up to be special at something great. They learn to serve and protect. They learn to care about people and they learn how to help. Even if a cat's stuck in a tree, a good officer is there to help! It's never too early to start that good guy training, and this cool SWAT costume can do just that for any young Police enthusiast! 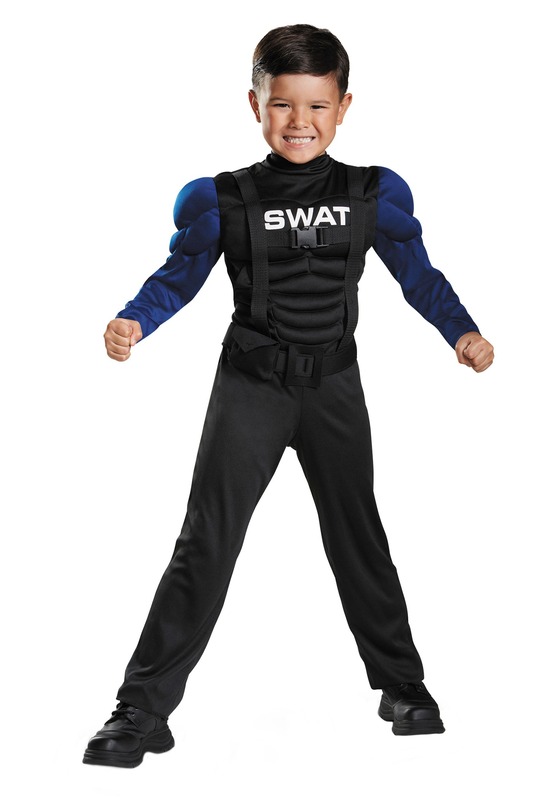 Put them in this SWAT Toddler Muscle costume and teach them to use their strength for good. He'll sure feel authentic just like a real SWAT officer with the full jumpsuit that fastens with hook and loops at the back. The filled chest-piece gives them muscles for strength. There are other attached straps, and SWAT is printed across the front so there's no mistaking what team they're on! The foam belt goes around the waist and sports a cool little pouch they can keep stuff in should they choose. Long after Halloween is through, we think your little one is going to love pretending to be a good guy with this realistic SWAT costume. Long afternoons of investigating, jumping, and climbing will create lasting memories. And who knows, maybe they'll be inspired to grow up and become a real Police Officer someday!